As Clint Eastwood memorably said: "You've got to ask yourself one question. 'Do I feel lucky?' Well, do ya, punk?" Because the time has come, much anticipated I'm sure, to put you all out of your misery and announce the winners of the two recent giveaways on Fluff and Fripperies, as selected by random.org. Drumroll, please! First up, the winner of the Clarins Men product set is none other than...Amy! 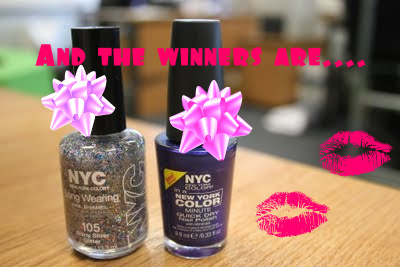 And the five NYC winners are: Iorweld, Tabitha Rose, Wendy Keogh, Claire Bradley and Brid. To claim yis're prizes, drop me an email with your postal address (fluffandfripperies AT gmail DOT com) before lunchtime on Friday. If I don't hear from you, I'll draw again. Congrats all, and thanks for reading! Congrats to the winners, I wasn't in so I don't know why I'm disappointed not to win, will have to make sure I actually enter next time and don't just think about it!